Previous research showed a significant effect for an intervention using deliberate practice with age group swimmers (Havriluk, 2006). The purpose of the present study was to determine the effect of deliberate practice on the technique of national caliber swimmers where, in comparison to the age groupers, the habit strength would likely be more resistant to change. The subjects included 19 national caliber swimmers (11 male and 8 female). The swimmers were pretested with Aquanex+Video on all four strokes. An instructional intervention included two classroom and three poolside sessions designed to improve technique (as measured by the active drag coefficient, Cd). The intervention was consistent with the concepts of deliberate practice (Ericsson, Krampe, & Tesch-Romer, 1993) and included clear instructions, appropriate task difficulty, immediate feedback, individualized supervision, a variety of learning strategies, tasks designed to maintain swimmer’s focus in the cognitive and associative learning stages, and replication of superior performance. After the intervention, the swimmers were asked to continue to practice deliberately for one month during regular team training and were then posttested. There was a significant decrease (improvement) in the Cd (p<.05). There was no significant change in swimming velocity, but there was a significant decrease in average hand force (p<.05). The results demonstrate that even a relatively short duration of deliberate practice can make a meaningful improvement in technique for swimmers of a very high ability level. 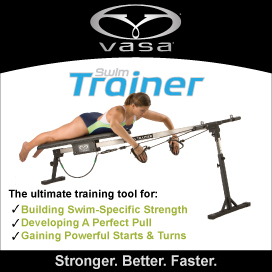 Because of the technique improvement, the swimmers were able to swim as fast on the posttest with less force, and therefore, less effort. Havriluk, R. (2006). Magnitude of the effect of an instructional intervention on swimming technique and performance. In J. P. Vilas-Boas, F. Alves, A. Marques (Eds. ), Biomechanics and Medicine in Swimming X. Portuguese Journal of Sport Sciences, 6(Suppl. 2), 218-220.